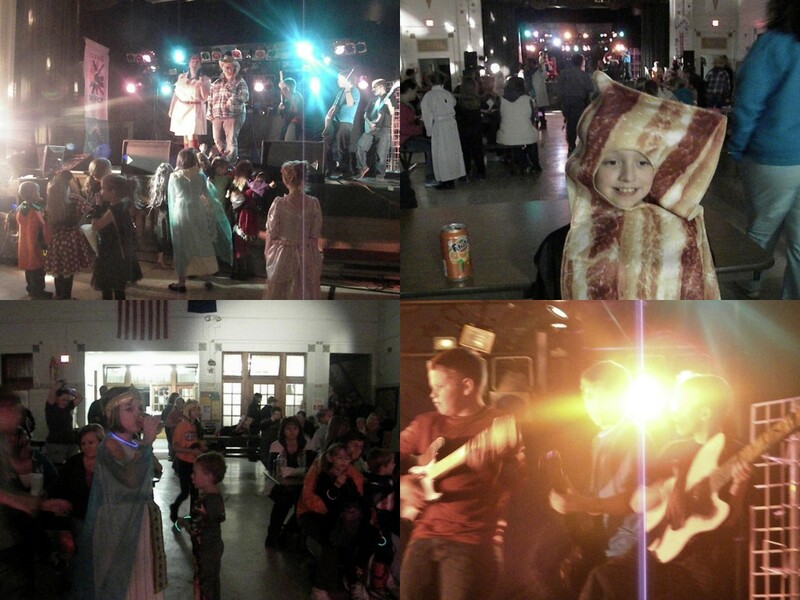 The evening of October 23rd, 2013 the children from our parishes and school enjoyed our Halloween Costume Dance here at SHAS. It was well attended. Concessions were made available by SHAS Home and School officers and school staff. Special thanks to Heather Rinke for her organizing and preparing food for this event! Next week will be Halloween. There will be costume and treat parties in classrooms. Please keep costumes, non-violent/evil nor terrifying to young children. Obviously we cannot have pretend weapons such as; swords, guns, and pitchforks. Boys and Girls, please have a very safe and blessed Halloween!!! The week of October 7-11, 2013 was Fire Prevention Week. All Sacred Heart Area School students visited the fire hall, where everyone got to shoot the firehose. Students learned that if you are holding the nozzle and want the water to spray up, everyone holding the hose has to go down. 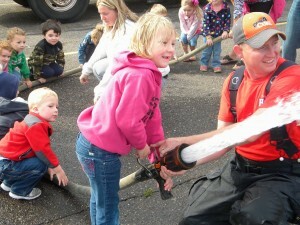 “Hats off” to our Junior Firemen. Other happenings during the week were the firedepartment’s open house and 3rd-5th grade students took part in the fire prevention week poster contest. Teachers enforced fire safety in the classroom and we had fire drills. This annual tradition is meant to make children more aware of the dangers of fire and how to stay safe at home and school. We thank all the men and women of the Staples Fire Department for their service to our community and for hosting such a great week for kids! Our school’s marathon was held Wednesday, October 16th. We had a beautiful day! 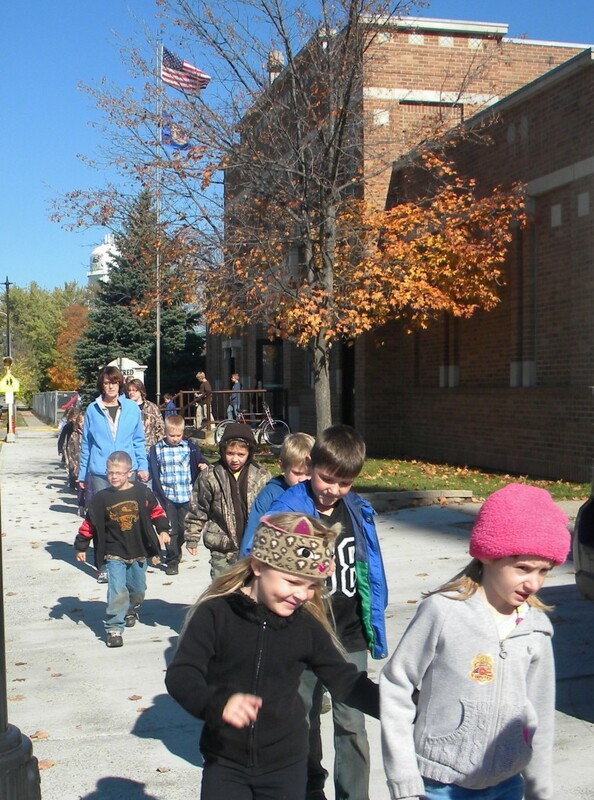 Students in grades 1-6 made the journey from SHAS over the overpass to the Lincoln School Park. Preschoolers and Kindergarteners took traveled up to the Northern Pacific Railroad Park. Our school families raised approximately $10,000, which was the goal set. We thank all of you who so generously pledged toward our students’ participation. Thank you parents and students for all your hard work! Expect pony rides for preschoolers and kindergarteners the first week of November (prior to deer hunting) and a swim party the week of Thanksgiving. We also thank Kathryn Edwards (parent) for chairing this year’s event. Next year’s plans are for a service/work-a-thon. In sharing our Catholic faith in Christ, we foster spiritual and academic formation in a positive and welcoming atmosphere that reflects love and respect for all. © 2019 Sacred Heart Area School All Rights Reserved.